Any time Cy Young chatter has revolved around a Los Angeles Angels pitcher over the past few years, that pitcher was invariably Jered Weaver. 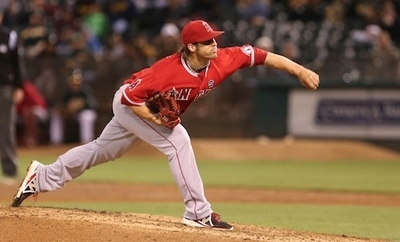 Weaver had been the Halos’ true ace, posting a 51-25 record and a 2.73 ERA from 2010-2012. That kind of year-to-year dominance usually solidifies a pitcher’s ace status for years to come. C.J. Wilson has had other ideas, however, as he has turned in one of his best seasons as a starter. While Weaver suffered a long-term injury just a few starts into his season, Wilson held down the fort and is currently at 17-6 with a 3.36 ERA (Weaver’s ERA is also 3.36). That is exactly the Wilson that GM Jerry Dipoto wanted to see when he signed the lefty to a monster five-year, $77 million contract before the 2012 season. While Wilson is far from Cy Young contention (that award will be taken by either Max Scherzer or Felix Hernandez), he has clearly been one of the most valuable players for the Angels this season. He is a bedrock of stability in a rotation that has been sorely lacking in it, and has improved to an average of 6.4 innings pitched per start, a marked improvement over 2012 when he walked 91 batters and averaged just 5.9 innings per start. Garrett Richards (5-2, 2.90 ERA) looks like he’s locked up a role as the third starting pitcher if he wants it next year. Wilson will likely return to no. 2 status next year, but only because Weaver will have made a full recovery from injuries that have nagged him all year. If the Angels can make it back to a respectable .500 by season’s end, they’ll have Wilson to thank as much as any offensive player.